I’d probably say that of all the big films coming out in theaters this summer, All the Way might’ve just been my most anticipated of all of those. Based on the brilliant play by Robert Schenkkan, HBO will be airing the film on Saturday May 21st. I’ve been looking forward to this one because I saw the play about a year ago and fell in love with it. I didn’t see it on Broadway, but the Zach Scott here in Austin was doing a production of it. I’ve also been looking forward to the film because it could potentially be the first proper screen portrayal of President Lyndon Johnson on any medium. There have been numerous films, one-man shows, and so on with Johnson featured somehow, but it was never the portrayal of a man who helped defeat segregation in 1960s America deserved or needed. While All the Way can feel a bit long at times and is not a perfect film, but is elevated by a terrific screenplay by Schenkkan, and incredible performances by every actor. All the Way follows LBJ (Bryan Cranston) right as he’s leaving Parkland Hospital in Dallas, Texas, where President Kennedy was pronounced dead on 11/22/63. Just days after Johnson is sworn in as President, he addresses all of Congress and urges them to sign the Civil Rights Act into law, a bill that Kennedy had attempted to pass but was unsuccessful before his death. The entire film follows Johnson as he successfully passed this said bill in just months, but is also a character study into Johnson, a southern Democrat who’s risking losing support from his own party due to this bill. Jay Roach, a director best known for the Austin Powers films and a handful of terrific HBO films, directs All the Way. I like Roach, and I especially like him when he’s directing films (Recount, Game Change) for HBO. However, this might’ve been one of his weaker efforts as a director. The film isn’t bad, far from it actually, but I felt that Roach had some questionable directing choices. The film runs a little over two hours, and 10-15 minutes could’ve potentially been cut out of the film. I also felt that James Newton Howard’s blaring orchestral score was a bit much at times, and helped make the film a little too sappy at times. But honestly, other than those complaints, I really enjoyed the film adaptation of All the Way. While the play is much better than the film adaptation is, this is still a must-see film for political historians like myself and also a very timely film, even for 2016. Schenkkan’s adaptation of his own play is really fantastic. We’re able to see each side of this story, from Johnson’s POV, to the “Dixie-crats” point, to Hoover (Stephen Root), MLK (Anthony Mackie), and so on. The screenplay is smart, informative without feeling boring, entertaining, dramatic, and even very, very funny. This helps because Cranston, who won a Tony for playing Johnson in this play a few years back, is beyond brilliant in this movie. As mentioned before, there have been several screen portrayal’s of Johnson in the past, but Cranston’s performance is the first that captures Johnson’s voice, mannerisms, humor, and psyche is all entirely perfect. Cranston, who wears a prosthetic nose and other forms of makeup to transform into Johnson, disappears into the role. 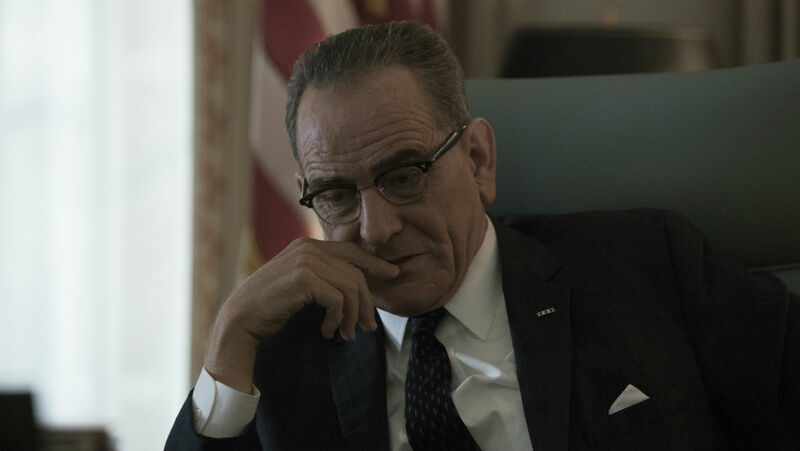 I never thought I was watching Bryan Cranston the actor playing Lyndon Johnson. I was watching Lyndon Johnson, a president who I’ve looked up to since I was a kid, on the screen. It’s easily the best performance by any actor that I’ve seen this year, and this performance is essentially a guarantee for Cranston to pick up several acting awards for his fantastic performance. While Cranston steals the show and spotlight from every actor when he’s on-screen, the rest of the ensemble is really fantastic in this film. Mackie as Martin Luther King, Jr. is really terrific. The performance is obviously a critical one, but not as big as many would think in the film. For the first hour, the most fascinating character dynamic is between Johnson and Sen. Richard Russell (Frank Langella), a senator from Georgia who was an ally of Johnson’s before Johnson decided he would put the Civil Rights bill into law. The back-and-forth between the two is fascinating to watch unfold on-screen, and one of the very best components of all the way. We also get great performances by Bradley Whitford as Hubert Humphrey, Root as Hoover, and Melissa Leo as Lady Bird, Johnson’s wife who’s by his side when he’s at his most vulnerable. If you’ve got nothing going on Saturday night, I highly recommend that you check out All the Way when it premieres on HBO. As mentioned before, the film itself is a little uneven, but watching Cranston’s performance as LBJ is a revelation to marvel. It’s also an important and timely film for 2016, a year in which racism is still a rampant part of this election cycle, and how a new civil rights movement has emerged from the LGBT community. This is especially an important film for many of you to see if you’re on the side of our “wonderful” Governor and Lt. Governor here in Texas, who both feel that we should discriminate against who can go into bathrooms and who can’t because of their deep-rooted hated of gay and transgender people. Forgive me for my little political rant, but All the Way is definitely worth seeing, especially in the times that we’re living in.